Cook bacon until crispy and reserve fat. 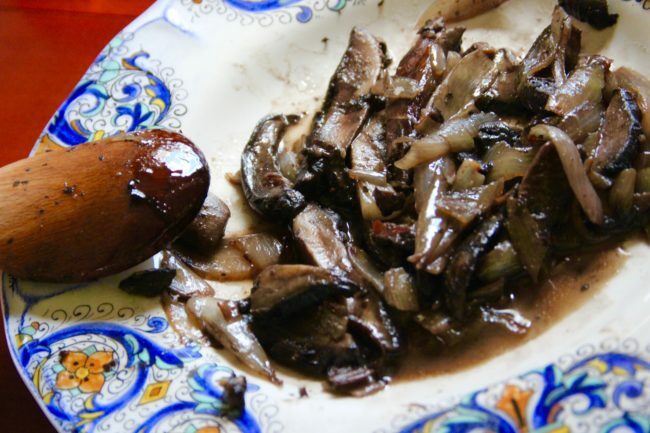 Chop onions and mushrooms and sauté with the bacon fat, 1 tablespoon of butter, one of olive oil util tender. Put aside and keep warm. 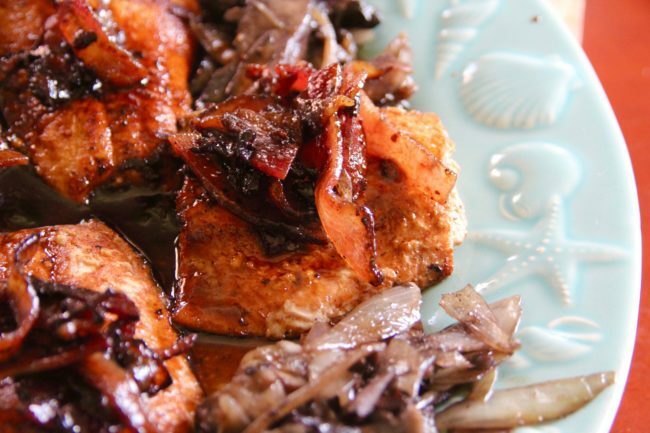 Place cooked bacon sliced into a chiffonade (thin slices)into same pan, add 1 tablespoon of butter and 1/4 cup of maple syrup. Heat and stir for just 2 minutes until the bacon is nicely coated. Place aside and keep warm. 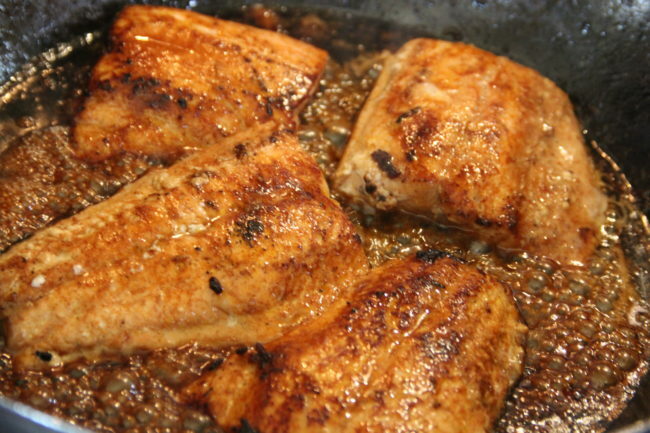 Dust salmon with smoked paprika, place in the same pan with 2 tablespoons of butter, 2 of olive oil flesh side down. cook on medium flame until browned – about 3 minutes. Flip, coat with maple syrup (about 1/2 cup) and finish cooking for another 3 min, or until fish flakes. Place fish on a platter and keep warm. Pour 1/4 of a beer into same pane and deglaze pan, scraping off the bits in the pan as you stir the contents over a medium heat. Reduce until slightly thickened. Time to assemble! 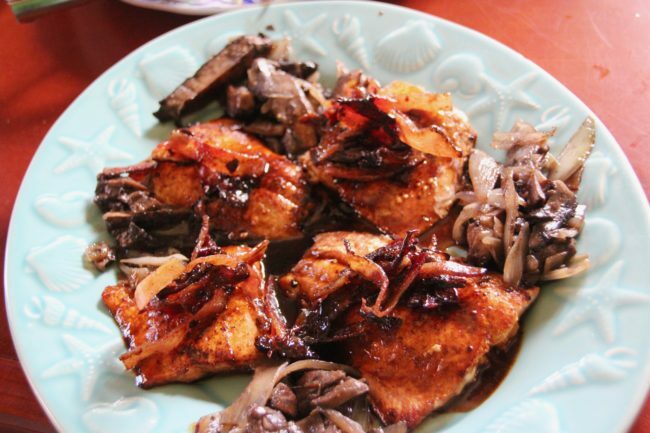 Place fish on a nice platter and surround with sautéd mushroom and shallots. 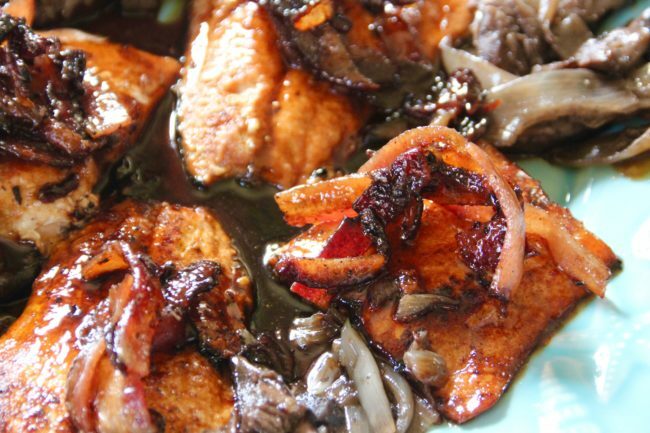 Place deglazed sauce on the salmon and top with bacon.